— and the list goes on. So why not 'food insurance'? I consider canned and frozen foods as short-term food insurance - because of their relatively short shelf life. But freeze-dried foods? Definitely long-term food insurance. The question we each have to answer is: How long do we want our food insurance to last? Six months? One year? Two years? 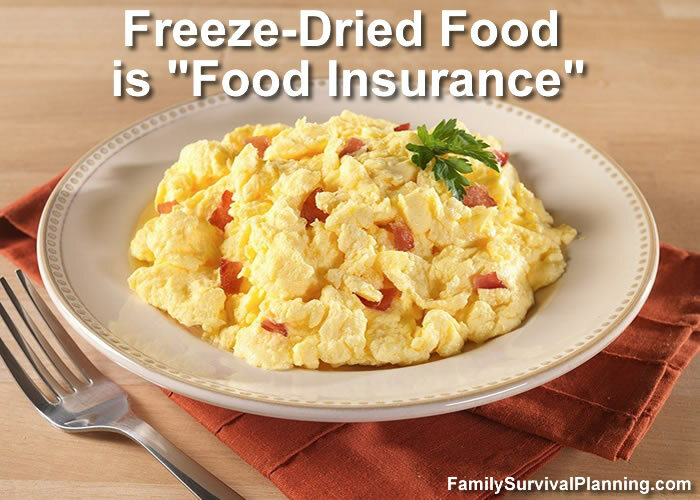 Freeze-dried food is still the easiest and tastiest "food insurance" you can buy. It can be purchased in 4 to 12-serving pouches, #10 cans, or buckets filled with pouches of food. You can store a lot more food in a smaller space. Can be eaten just by adding water to hydrate. Retains the taste and texture of fresh food. Usually costs less than $3.00 per serving. Many times you might have heard someone say that if you need to suddenly eat only freeze-dried or dehydrated food in an emergency, and your body isn't used to eating that sort of food, your digestive tract may really struggle. Is that really true? 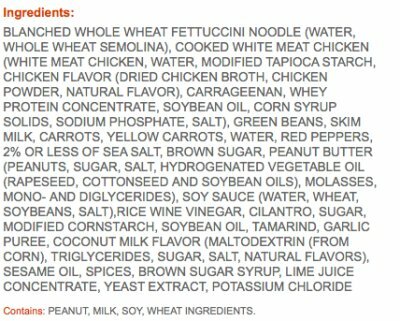 Let's take a look at the ingredients. CONTAINS: Wheat, Milk, Soy Manufactured in a facility that processes tree nuts, wheat, soy, and milk. Which would you choose to feed your family? The ingredients of freeze-dried and dehydrated foods are shown on the cans of nearly every preparedness website. If you buy a #10 can of vegetables, you will get ONLY vegetables — nothing more. No additives — no preservatives. The same is true for fruits. That is definitely NOT the case with canned or packaged foods. So the idea that these foods upset our digestive systems is entirely a myth. There is one caveat however. If you eat enough of this food right out of the can (and it is tasty enough to do that), without consuming enough water, it will hydrate and swell in the digestive system. But this is true of any dried foods, such as Cheerios or dehydrated fruits bought at the store. Myth #2: Freeze-Dried Food is expensive - isn't it? Maybe. But what if I told you that it could be less expensive. Let's just talk about produce for a moment — fruits and vegetables. How many times have you thrown out spoiled fresh produce before you had a chance to eat it? How old is that "fresh" produce by the time you bring it home from the store? 1 week? 2 weeks? More? And how was it grown? And where? Did they use pesticides (which will go into your body)? Is it truly organic (meaning, hopefully, no pesticides)? But it's nice to have complete meals you can prepare in a few minutes with a little water during a crisis. Whenever you look at the prices of full meal #10 cans on a preparedness website, get out your calculator. They always state the number of servings in a can. Divide the price by the number of servings. For instance: the ingredients listed above are from a can of Chicken Fettuccine Alfredo from Auguson Farms. At the time of this article, the price is $34.99 per can. Dividing $34.99 by 14 servings = $2.50 per serving. Is there anywhere you can purchase frozen or restaurant chicken fettuccine alfredo for $2.50 per serving? It's true that different brands may list a different number of servings, and various sizes of servings and, of course, the prices will differ. It is up to you to do the math to get the most for your money. I try to never buy any food unless it's on sale. It takes diligence and careful watching for the sales. 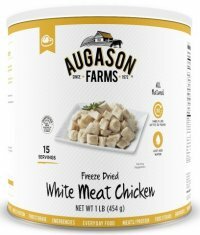 Not sure you'll like freeze-dried foods? 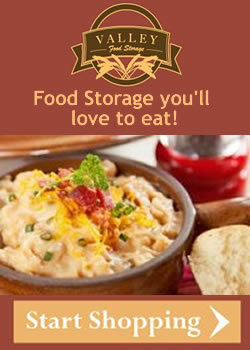 Try a FREE Sample from Valley Food Storage. A couple of years ago I was able to attend the Self Reliance Expo where I taste-tested many different brands of freeze-dried foods. This is my review of some of the varieties I tried. 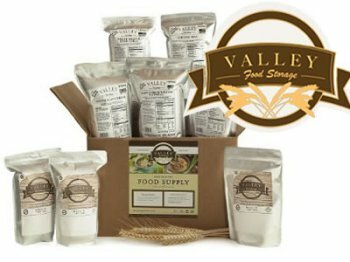 Valley Food Storage - I love that their food comes in pouches that serve anywhere from 5-10 people — use the whole pouch or just part of it. Smaller containers like this avoid waste; once a #10 can is open, you must use the product in a relatively short time to retain its nutrition. This is "real" high quality food, prepared without the fillers, MSG, GMO, and preservatives. You know exactly what is in each meal — just as if you were preparing it from scratch in your own kitchen. The shelf life will actually hold up to the 25 year promise. These criteria are important for my family. But if you need larger amounts, Valley Food Storage also has buckets filled with their individual bags of quality foods. Want to try before you buy? Call and ask for a FREE SAMPLE - your choice of product. No shipping, no hidden charges. Just 100% free! 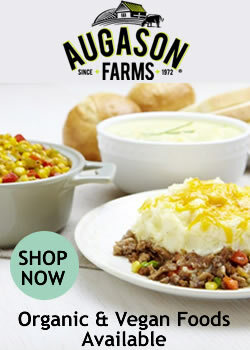 Augason Farms has a good variety of full meal entrees that are unique to their brand, as well as the usual fruits and vegetables. They also have vegan and organic foods available. At the Self Reliance Expo I tasted the corn and the peas —not rehydrated right out of the can — and they were delicious. The peas were slightly sweet but the corn tasted almost like candy! Tasted like fresh veggies . . . but . . . umm . . . dried. 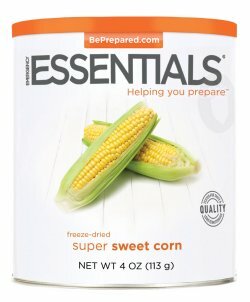 Emergency Essentials® - This brand includes both freeze-dried and dehydrated foods. There are plenty of the usual fruits, vegetables, and meals, as well as shortening, butter, potato slices, instant chocolate pudding, gourmet mixes, legumes, grains, pasta . . . and much more. At the Expo I attended, Emergency Essentials cooked up some of their full-meal varieties to taste, as well as samples of some of the freeze-dried foods right out of the can. Cooked or not, I found them both to be delicious — especially the fruits — great for snacks any time. 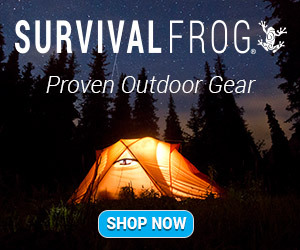 There is a smaller size can that is perfect for camping, or just to try before investing in the larger (#10 size) cans. They have the same long term shelf life as all other freeze-dried and dehydrated foods in #10 cans and include pretty much the same products as the #10 cans, such as butter powder, instant milk, whole egg powder, fruits, vegetables, spices, etc. What the small cans don't have are full meals. They are perfect for filling your pantry with essentials. 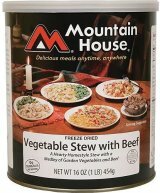 So far, there isn't a Mountain House product that I didn't like (haven't tasted all of them). Check this comparison I did to find out how some freeze-dried foods can be cheaper, and healthier, than fresh! Freeze-dried foods retain more of the nutritional value than canned or dehydrated, without the added chemicals and additives found in store-bought foods. Because many bulk foods are packaged in an oxygen-free environment, there is no need for additives or preservatives to keep the food fresh. 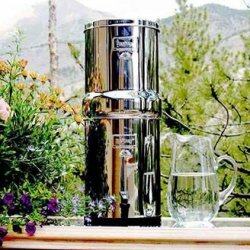 You may find that freeze-dried foods are the "best of the best" when it comes to food storage or quick meals while camping. Why? Because some contain all the ingredients and seasonings needed for a complete meal. Nothing more is needed, just a little cook time in hot water and they are ready to eat. The whole meals are pre-seasoned, pre-cooked and pre-mixed with other ingredients, making them the fastest, easiest and tastiest foods available. 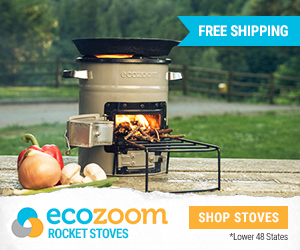 There are many package sizes to suit your budget, your space requirements, and your needs, whether you're using freeze-dried food for storage, camping, boating, hiking, or even brown-bagging at work. If you choose to fill your food storage with freeze-dried foods, you might want to try the pouch size or the small cans first to find out what your family likes. You may actually have to eat it some day should a crisis arise and it's best to be sure you have the varieties everyone likes. 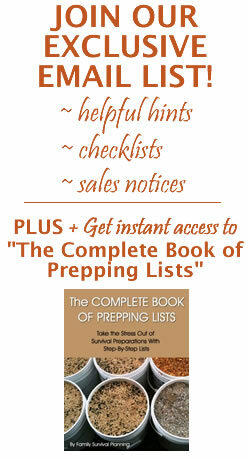 What Is the Shelf Life of My Food Storage?